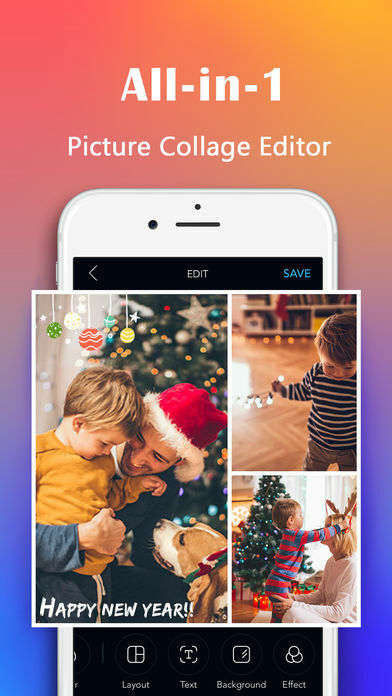 With more than 100 million installs, LiveCollage is the BEST photo collage maker & photo editor ! Make perfect pic collages of all your wonderful moments and memories. LiveCollage’s smooth, intuitive process make it very easy to control your editing & making. LiveCollage has everything you need to create fantastic collages with your photos. It never be so easy to unleash your creativity. – Classic: fully adjustable basic layout, remix up to 16 photos. – Font: add clever captions & next trending meme with our amazing hand-picked fonts. – Frame: beautify your photos into framed artwork with 500+ creative photo borders. – Filters: trendy Retouch filters – Portrait and Vintage, Classic, Double-exposure, Texture, Light etc. – Background: brush your photo background with a bit colors. – Blur: create blurred background for photo. – Ratio for fb cover, fb post, twitter post, iPhone4/5/6 wallpaper. – Photo Editor: professional designed filters, touch-up tools(draw, redeye, blemish, etc) and more! – Retouch: Tune your face with Acne, Tooth, Smooth, Face, Tone facetune toolbox etc. – Slideshow: Transform photos into stunning video. – Magic Video Filter: Add amazing animated and very cool video filters to make fun & incredible videos. – MotionSticker camera: Make and send fun video message with amazing & funny live stickers to your friends. – Explore your saved collages via built-in gallery. – Share your creations to Instagram, Facebook, Twitter, SMS, email, and more.